In this work, we derive the Cramer-Rao lower bound (CRLB) on the position error for an RFID tag positioning system exploiting multipath. The channels constituting the backscatter radio system are modeled with a hybrid deterministic/stochastic channel model. In this way, both the geometry of the deterministic multipath components (MPCs) and the diffuse multipath are taken into account properly. Computational results show the influence of the room geometry on the bound and the importance of the diffuse multipath in dense indoor environments. Time reversal (TR) processing using the deterministic MPCs is analyzed as one possibility to overcome the degenerate nature of the backscatter channel. A derivation and evaluation of the corresponding CRLB shows the potential gain of TR processing as well as its strong dependence on the geometry. 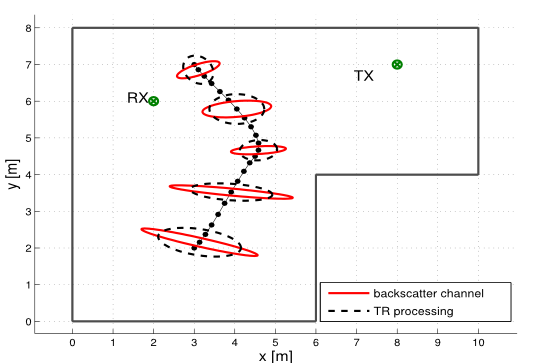 The figure shows the position error ellipses for the forty-fold standard deviation for several trajectory positions, in red for the backscatter channel alone and in black (dashed) with TR processing. Here, one can see that the error depends on the geometry and it is lower in the direction of the TX and RX radar nodes, because MPCs from other directions are strongly impaired by DM. Another interesting fact is that TR processing partly levels this imbalance. It improves the information from reflected MPCs, while loosing information from the LOS component, which gets also affected by DM due to TR processing.